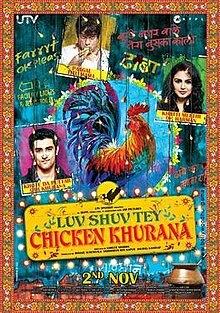 On the whole, LUV SHUV TEY CHICKEN KHURANA is a joyride from start to end. The film works because the written material, the execution of the subject and the performances complement each other wonderfully. This delectable dish ought to be savoured for certain! On the whole, COCKTAIL has a fascinating first half, charismatic performances, harmonious music and the trendy look and styling as its aces, but the second half is not as tempting or intoxicating as the first hour. It pales when compared to the attention-grabbing first hour. Yet, all said and done, this one's primarily targeted at the Gen Next, especially those in metros, who might identify with the on-screen characters. On the whole, ROWDY RATHORE is designed to magnetize the masses in hordes. The accurate blend of action, emotions, drama and humor, besides a superlative performance by Akshay Kumar, makes this motion picture an immensely pleasurable and delightful movie watching experience. If you savor typicalmasaledaarfares, this one should be on your have-to-watch listing for certain.Dhamaalentertainer! On the whole, ISHAQZAADE, a volatile and intense story with ample doses of fanatical romance, should appeal to a pan-India audience. This broadly engaging love story has a winsome pair who deliver dexterous performances, besides popular music and several poignant moments, which should appeal to fans of mainstream films. Go for it! On the whole, JANNAT 2 is an engaging film with tremendous appeal for the masses. An absorbing story, a swift and coherent narrative, exemplary direction, fantastic action, soothing music and stellar performances summarize the highlights of this triumphant franchise. On the whole, TEZZ is a taut, entertaining action spectacle. Those with an appetite for well-made thrillers should lap it up!